EMLab P&K’s IAQ training courses cover an array of topics including mold testing, data interpretation, Legionella contamination and more. Environmental professionals can earn continuing education credits for technical training. Upon completion of the training (based on minutes attended) and survey completion, all attendees receive a certificate of attendance that they then can submit to their accreditation providers such as: ABIH, ACAC, BCSP, BCRSP, CAHPI(BC), CRBOH, and InterNACHI for continuing education credit. 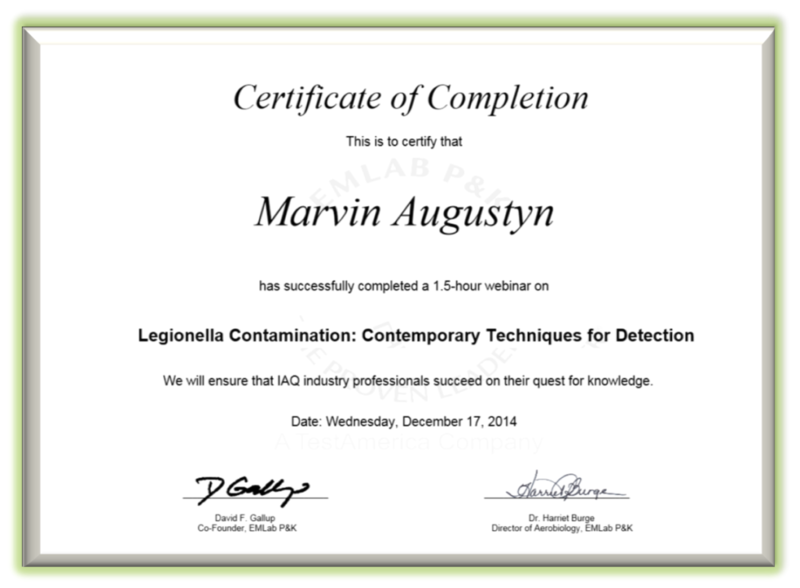 EMLab P&K, a TestAmerica company and the leading commercial indoor air quality (IAQ) laboratory in North America, continues to raise the bar in the IAQ industry by providing in-depth webinars developed for professionals with a moderate level of experience in the IAQ field. The environmental webinars educate on specific topics, industry trends, and IAQ methodologies, and are presented by industry leaders including Dr. Harriet Burge, Dr. Michael Berg, and Dave Gallup. EMLab P&K, a TestAmerica company, is the leading commercial indoor air quality laboratory in North America with over 60 service and drop-off locations across the United States. EMLab P&K specializes in analyzing air and surface samples to identify mold, bacteria, asbestos, and allergens. EMLab P&K also offers USP <797> testing, PCR testing, radon analysis, and materials testing. EMLab P&K has an extensive list of accreditations and certifications from leading organizations and government agencies including: AIHA-LAP, LLC, NVLAP, CA-ELAP, Texas DSHS and other state licensing and certification programs. For more information, visit the company website at https://www.emlab.com or call 866-888-6653.